SIMPLE SABOTAGE is not about developing major strategy overhauls or transforming organizations with breakthrough ideas. Rather, it’s about detecting the seemingly innocuous behaviors and interactions we perform every day that, when taken to the extreme, have the potential to destroy an organization bit by bit over time – death by a thousand cuts, exactly what the OSS intended. 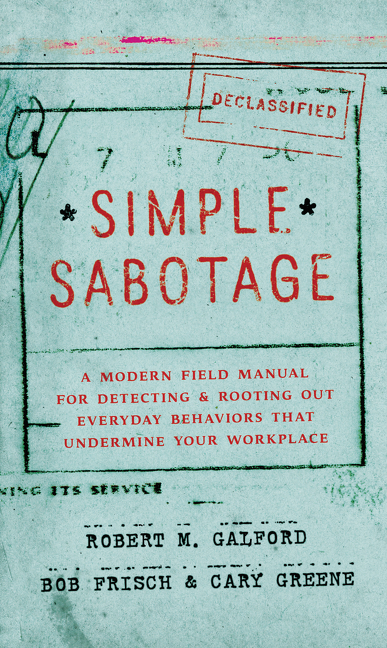 Galford offer countermeasures for each of the eight sabotage tactics, providing strategies for identifying and removing these acts of unintentional sabotage – whether you identify them in your colleagues or even yourself. As a result, people in working groups of any kind will increase their effectiveness, spur creativity, restore relationships with colleagues, and ensure that work isn’t more difficult than it has to be. ② What Will Your Leadership Legacy Be? You might be your company’s biggest rainmaker or most brilliant strategist. But if you jumped ship or disappeared today, what would you leave behind? What would the people with whom you’ve worked do differently because they worked with you? Robert Galford, the coauthor of Your Leadership Legacy, shows that your impact on others is what becomes your leadership legacy. It has more to do with who you are as a person (your natural leadership style) than with your abilities or job title. Most people tend to fall into one of six leadership roles. Galford explains that although natural tendencies can be slightly influenced and accentuated, your goal should be to align your intended legacies as closely with your natural style as possible. In this speech you will learn how to define your natural role with clarity so you can sort out the distinctions between your roles and titles, and identify where you get the greatest satisfaction and where your strengths lie. Ultimately, it gives you something to think about as you plan the kind of legacy you want to leave and become a better leader today. ③ Trusted Advisor, Trusted Leader. So What? Now What? We all know that those working in senior levels in organizations have a high level of expertise and serve as leaders and mentors. Continuing on the path laid by The Trusted Advisor and The Trusted Leader, this speech challenges the assumption that doing “more of the same” is all that is left for high achievers. 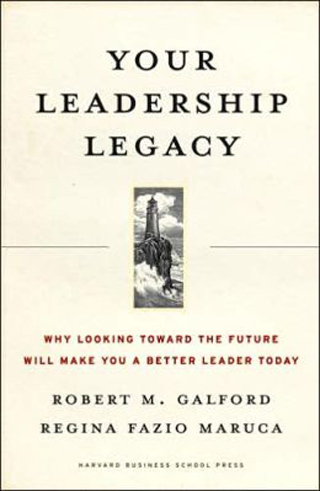 Robert Galford, the coauthor of Your Leadership Legacy, believes that as individuals retain and deepen their skills, they go through a migration that moves them through the states of trusted advisor and trusted leader to the territory of building a legacy. Galford stresses that you should not be what you’re remembered for your legacy; rather, your legacy should be what others take away on an enduring basis as a result of having worked with you. Your legacy is what makes you a better leader for the rest of your career. You will learn that building this legacy requires development work in three crucial areas. First it begins by honing one’s craft and becoming a trusted advisor to others. The advisor then carries these tenets of trust into the next role – that of the trusted leader. Finally, leaders cultivate their legacies, making them better and more effective leaders today. Rob Galford is a Managing Partner of the Center for Leading Organizations and a Leadership Fellow in Executive Education at the Harvard University Graduate School of Design. He divides his time across teaching on Executive Education programs and working with senior executives at the world’s leading private, public and governmental entities on the issues that lie at the intersection of strategy, organization and leadership. He has taught on these disciplines on the Executive Programs at the Columbia University Graduate School of Business, the Kellogg Graduate School of Management at Northwestern University, and subsequently at Harvard. He also serves on the faculty of the National Association of Corporate Directors where he is a Board Governance Fellow. Rob was formerly a Managing Partner with the Center for Executive Development in Boston. Earlier in his career, Rob was Executive Vice President and Chief People Officer of Digitas (NASDAQ:DTAS), a marketing services firm with offices across the U.S. and Europe that is now part of Publicis Groupe. He was also a Vice President of The MAC Group and its successor firm, Gemini Consulting, focusing on the strategic and organizational challenges facing global professional services and financial services firms. While there, he worked for a number of years in Western Europe prior to returning to the U.S., where he took on a variety of firm administrative and managerial responsibilities. Rob has practiced law with the international firm of Curtis, Mallet-Prevost, Colt & Mosle in New York, and has also worked in investment management, first for Citicorp in New York, and later in Boston. In addition, he has taught Management Policy in the MBA Program at Boston University Graduate School of Management. Rob is a frequent author and contributor to the Harvard Business Review, including "When an Executive Defects", "Why Can't This HR Department Get Any Respect?" ,"What's He Waiting For? ", "The Enemies of Trust", and “Succession and Failure”, along with numerous blogs on leadership topics for harvardbusiness.org. His work also has appeared frequently in the Boston Globe, where he served as one of the regular "Job Doc" advice columnists in the Sunday Globe, and he has been featured or quoted in such other publications as Directorship, Inc. Magazine and The American Lawyer. Rob is the co-author of The Trusted Advisor (with David Maister and Charles Green), initially published by Free Press/Simon and Schuster and subsequently reissued in paperback by Touchstone/Simon and Schuster. 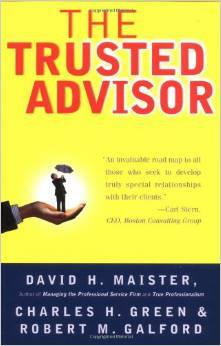 The Trusted Advisor has been on business best-seller lists since the time of its publication. 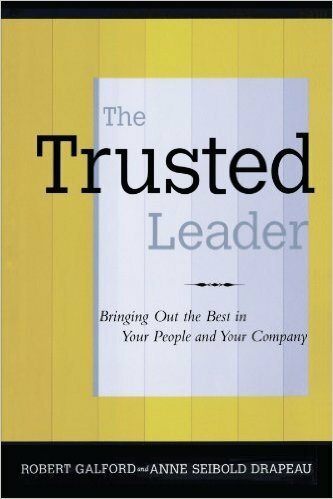 His second book, The Trusted Leader (co-authored with Anne Drapeau), was published by The Free Press. His third book, Your Leadership Legacy, co-authored with Regina Maruca, was published by Harvard Business School Press. His fourth book, co-authored with Bob Frisch and Cary Greene, is Simple Sabotage (HarperOne, 2015). Rob has been a member of the Board of Directors of Forrester Research, Inc. (NASDAQ:FORR) since the time of its initial public offering, and chairs the Board’s Compensation and Nominating Committee. He also serves as an outside Board Advisor to the national architectural firm, Shepley, Bulfinch. He also hosts the business video, Talk About Change! with the popular cartoon character, Dilbert. He has been named to the Directorship 100 as one of the leading thinkers on board and corporate governance, and has also received a Lifetime Recognition Award as one of the top Thought Leaders in Trust from Trust Across America. 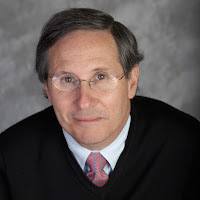 Rob’s educational background includes Liceo Segre, Turin, Italy, a BA in Economics and Italian Literature from Haverford College, an MBA from Harvard Business School and a JD from Georgetown University Law Center, where he was an Associate Editor of The Tax Lawyer.